What was supposed to be a romantic 34th anniversary cruise for a Tarzana couple has turned into a nightmare of sunken dreams and lost cash. This spring, Ken and Pam Brazile planned to spend eight days enjoying the Caribbean sunshine and listening to R & B performers on the "Maxwell & the Seven Seas" concert cruise. They’d reserved $16,000 tickets, which would grant them VIP access, letting them hobnob with singer Maxwell, as well as celebrities like Chef Garvin, Boney James and Brian Culberson. But after paying nearly $12,000 in installments for their tickets, the couple learned the cruise has been canceled, and instead of a refund, they say all they’re getting are excuses. The couple paid the Phoenix, Arizona-based event promoter and planner, BTW at Sea, for passage aboard the chartered Royal Caribbean Freedom of the Seas cruise liner, May 3 through May 10. They charged the trip to their American Express card, making payments for several months, until the charges suddenly stopped appearing on their statement. "That’s when I went to their website and saw their banner of how sorry they were about the cruise," Pam Brazile said. That’s because BTW at Sea had called off the trip. The company offered no reason, but provided an online form for passengers to fill out. Despite submitting the form, and making repeated phone calls, the couple has not gotten their money back. Ken Brazile said a company spokesperson told him it would be many weeks, perhaps months, before their money is returned. "BTWCruises LLC is committed to doing all that it can to arrange refunds for customers due to the unfortunate cancellation of the Maxwell and the Seven Seas cruise. A number of events led to the cancellation and we continue to try to work with the parties involved to resolve the situation. "We will be working with the travel insurance company in an effort to arrange payment for those who purchased insurance. Part of the delay of the refunds relates to the credit card processing company for BTWCruises withholding funds due to BTWCruises. Because there may be litigation involved we are advised by our counsel not to provide further comment at this time." 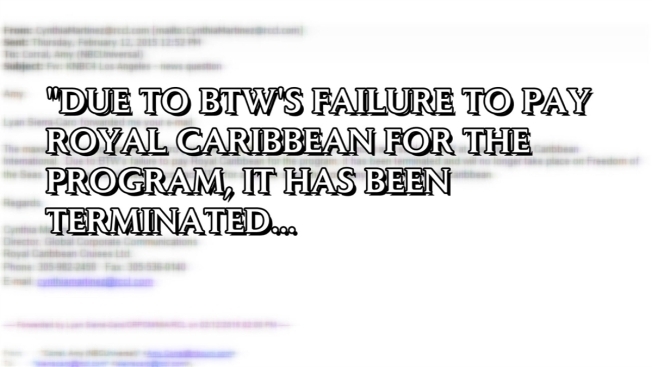 "Due to BTW’s failure to pay Royal Caribbean for the program, it has been terminated. Your viewers need to contact BTW for a refund since the company never paid Royal Caribbean." The Braziles are still waiting for word of a refund. They say without that money, they can’t afford to plan a different anniversary getaway. Ken Brazile is a retired commander with the Los Angeles County Sheriff’s Department, which makes the circumstances especially painful. "Any law enforcement officer will tell you they hate being victims," he said. "I hate being a victim. I feel like a victim." Consumer advocates say purchasing travel insurance can protect people in situations like this. If a consumer uses a credit card, he or she can contest the charge, but that doesn’t guarantee a refund. The couple has asked American Express to launch an investigation. The couple is also considering filing a complaint with the Federal Trade Commission.